Offering you a complete choice of products which include railway communication earthing rods. We are the supplier and manufacturer of Earthing Rods for Railway Communication & Signalling with perfection pertaining to Earthing, Lightning Protection, Transient Protection and Electrical Safety Systems. Our products are well maintained and have immense functional attributes. They are tested before their dispersal and are outstanding in terms of quality. We adhere to all the basic properties set by the market in order to offer products that contribute to the industrial platform. 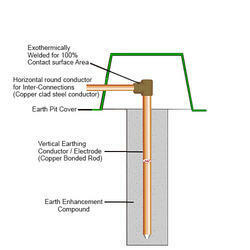 Looking for Earthing Electrodes for Railway Communication & Signalling ?